Karol J. Wojtyla’s own life is the best evidence for the truth of his famous maxim. Born on May 18, 1920, in Wadowice, Poland he survived the Nazi occupation, secretly studying for the priesthood at an underground seminary by night while toiling in a rock quarry by day, and later saw his country brought under the yoke of the Soviet Union. This double brush with totalitarianism left a deep mark on the man who would become Pope John Paul II – yet it never broke his spirit. He remained a charismatic figure with a deep love of arts and culture – a true man of the people. As bishop, Wojtyla contributed greatly to the Second Vatican Council, equipping the Church to preach the unchanging Gospel of Jesus Christ to a rapidly evolving modern world. Elected to the Throne of Peter in 1978, Pope John Paul II traveled the world, visiting more than 100 countries, receiving record numbers of pilgrims, and making a special effort to connect with the world’s youth. Throughout his papacy, John Paul II held up Christ crucified as the answer to the false ideologies of left, right, and center, not sparing the excesses of capitalism or the materialism of the West. He also thundered against the “culture of death,” and steered his brother bishops to a proper understanding of Vatican II. Struck down by four bullets in St. Peter’s Square on May 13, 1981, the feast of Our Lady of Fatima, Saint John Paul II transformed his suffering into grace by offering it up for the whole Church and eventually even forgiving the man who pulled the trigger. At the end of his life, Saint John Paul II bravely faced the ravages of Parkinson’s disease and, in imitation of the God he loved, once again offered up his own sufferings in union with those of Christ for the whole Church. John Paul II’s love for the Church did not end in death. A dying French nun, Sister Marie Simon-Pierre, prayed to the holy pope during her battle with Parkinson’s disease and was miraculously cured. A second miracle occurred when a 50-year-old Costa Rican woman was cured of a brain aneurysm after praying at a home-made shrine to the holy pope. Once these events were confirmed beyond doubt by the Church in 2014, Pope John Paul II was proclaimed a saint. His Feast Day is October 22nd. May his heavenly intercession protect you, heal you, and strengthen your faith in the God for whom he lived and suffered. 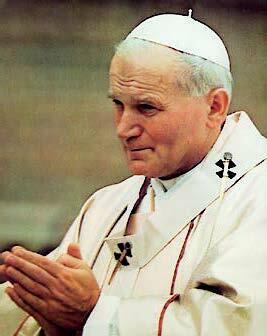 Saint John Paul the Great, pray for us!